…that’s a line from the outro of I Was There, my tribute to all the great venues and bands that made the rock scene so vibrant in the late seventies. 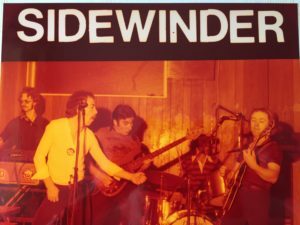 One of those bands was Sidewinder, the best band I ever played in. It was where I learned to be a real songwriter – the others were such great musicians, and Pat such a great singer, that I really pushed myself to come up with material that would do justice to their talents. Left to right in the picture above are me, Pat Silke, Christy Clarke, Kieran McCoy and Patsy Tracey, taken at our residency in the Baggot Inn in early 1979. A few of those songs have been re-recorded for my new albums – Sailing Ships is on “Some of These Stories Are True”, Complications and This Is The Movies are on “The Sad Pursuit”, and I did a rewrite of Smalltown Superstars for “An Irish Life”. The entire membership of Sidewinder made it to the Button Factory last week to see me preview the new material, and it was great to have all of them there. Dominic Clarke got us together for a reunion photograph afterwards. Everyone is still in great shape although Pat seems to have borrowed the other lads’ hair for the photo. It was also great to see all of the wives again, and all as glamorous as they were back in the day. The picture below shows Jackie (at left) with Yvonne Clarke, Marion McCoy, Bernie Silke and Josie Tracey. 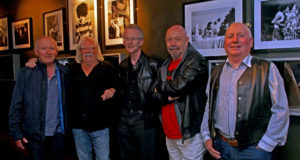 And, just to make the reunion complete, we got another shot of the band with Gerry McDonnell, our sound engineer, and Dominic Clarke, our lights man.